Cloud Servers are ideal way for your organization to offer cloud computing solutions to your clients without the cost of building your own infrastructure. Our servers reside in a pool of high performance host servers with clustered shared volumes on a storage attached network (SAN). Each server is configured to provide resiliency and ensure high availability via fail-over migration, live migration, and NIC teaming. Our host servers are setup in a fault-tolerant cluster. If a node experiences a hardware failure, your active workloads are automatically transferred to another node in the cluster to avoid downtime. With the ability to scale up or down as your business grows, you’ll can provide customized cloud solutions based on the specific needs of your clients. Dedicated servers provide direct control over your hardware and bandwidth utilization. They feature RAID-10 arrays, redundant power supplies, and environmental controls to ensure maximum uptime. You can choose from an array of pre-configured OS templates for a variety of Windows Servers from 2003 up to and including 2012 R2. 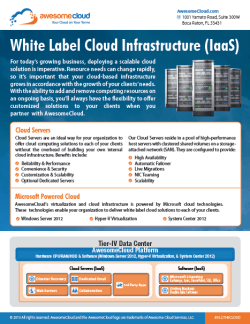 Partner with AwesomeCloud and resell white label cloud servers to grow your Managed Services business. Contact us by phone at 855.2.THECLOUD, by email at sales@awesomecloud.com, or by filling out a quick contact form.